Classic Southern fare comes straight out of Grandma's kitchen. Open Mon.-Thurs. 5 p.m.-9 p.m., Fri. 5 p.m.-10 p.m., Sat. 12 p.m.-9 p.m., Sun. 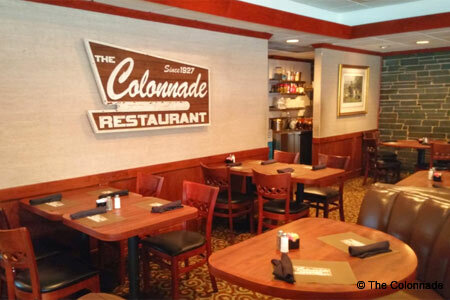 11:30 a.m.-9 p.m.
About the restaurant: The Colonnade was founded in 1927 and since then has secured its spot as an Atlanta classic, attracting a raft of regulars and requiring one to arrive early or expect to wait for a table. Warmed by a fireplace and a faux library motif, the bar accommodates patiently waiting patrons who gather for strong drinks and conversation. Décor is bolstered by traditional details, such as floral-pattern carpeting, but following a renovation finished years ago, the coffered ceiling now holds warm lighting. Veteran waitstaff and a quirky crowd combine to craft a unique experience. On Sunday, we'd suggest getting there before the after-church throng hits it hard. Food & Drinks: Appetizers start off with chicken livers and shrimp cocktail. The Colonnade produces some of the region's best fried chicken (lightly dusted with seasoned flour and always fried on the bone for flavor and juiciness) and yeast rolls, the latter a rapidly disappearing Southern treat. Also good are the salmon patties and pot roast. Do not miss the tomato aspic. Save room for a slice of one of the pies, especially the coconut cream.